Wood is no doubt a sustainable, versatile, and the only renewable raw material used in construction, but how sustainable is wood? Most importantly, how does it stack up against the conventional materials used in construction? During the Nexus Seminar held on 21 January, Prof. Peer Haller of TU Dresden walked us through his findings on “Back to the Nature: How Sustainable Is Construction with Wood?” and compared wood to steel and concrete from different perspectives. Overall, the construction industry has a huge environmental impact both directly and indirectly; it accounts for 23% of the total carbon dioxide emissions coming from all economic sectors and requires huge amounts of water (Huang et al. 2018). Mainstreaming wood in the construction industry can not only reduce carbon dioxide emissions but also address water scarcity, Prof. Haller argues. Addressing a room full of young and enthusiastic minds, he started his presentation by first explaining that we live in an age where our resources are depleting, and carbon dioxide emissions and global temperatures are hitting new records every year. Humankind heavily relies on forests rather than steel or concrete. Germany, for instance, has over 75 million cubic metres of wood that are annually usable. According to the national forest inventory, as of today, 60% of Germany’s wood is hardwood (i.e. beech trees) and 40% is softwood trees (i.e. Spurs trees). Typically, hardwood is preferred for construction as it has more “load bearing capacity” but softwood grows much faster than hardwood. Hence, we should strategically plan the use of such wood through forest policies. Germany has two forest policies – one which governs tree preservation by ensuring that the forests consist of multiple species and the other which governs economic aspects such as furniture production and housing. Through various construction tests, Prof. Haller found that wood can not only outperform steel and concrete in load bearing and tension tests, but it is also lighter and more resistant to leakages and can absorb shocks better. This is one of the reasons it is typically used in earthquake-prone regions around the world, where flexibility of the structure is necessary to absorb heavy shocks coming from earthquakes. Moreover, wood is the cheapest resource among the three and has the smallest carbon footprint. Further modifications such as carbon fibre coating, reshaping wood into various shapes by heating can result in better strength and durability of a structure. Further design-related modifications can yield up to 7.5 times more load bearing capacity. Such high strength and cost-effective engineered wood products are quite new in the market; Laminated Veneer Lumber (LVL) is one example of such a material. Apart from being the cheapest construction material, LVL also has 90% less carbon footprint than concrete and requires no water whereas water is a key element in making concrete. This is a new era in the construction industry, and many developers are catching up fast. Prof. Peer Haller then presented some case studies of buildings that have been constructed with wood, such as a residential building in the heart of Berlin, a 20-storey building in Vienna, and a proposed oak wood timber tower in London which will be 200 metres tall. While speaking on such bold projects, he raised concerns on the overuse of wood in construction, as this can be a great setback for sustainable construction. Construction requires huge amounts of water, and the usage varies depending on the size and design of the project. Since emerging economies contribute to 60% of construction in the world, planned use of wood in construction would have positive impacts on both carbon dioxide emissions and water stress. As the presentation came to an end, the audience raised questions on various opportunities and challenges of using wood in construction. 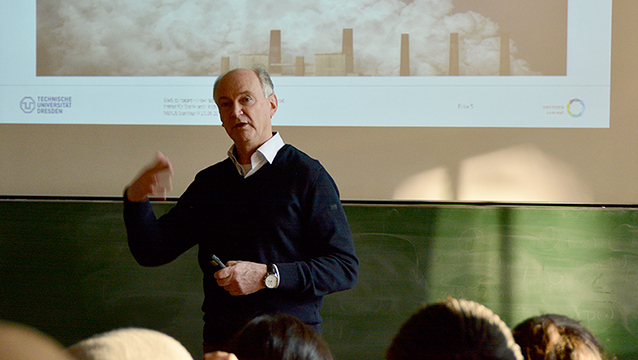 Prof. Haller disclosed that wooden structures are not as fireproof as compared to steel or concrete but hinted at new technological advancements which might be able to overcome these shortcomings. At the end, when asked if he would use a wooden or a plastic Christmas tree, he cheerfully said he would go for the former as Christmas tree farming is more sustainable than manufacturing plastic trees. 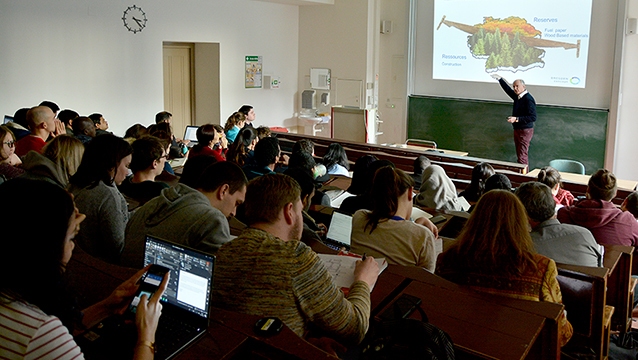 This Nexus Seminar is part of the joint seminar series of UNU-FLORES and TU Dresden, delivering thought-provoking lectures and stimulating discussions on the Nexus Approach to environmental resources management. Stay tuned to find out more about the next round of Nexus Seminars! Huang, Lizhen, Guri Krigsvoll, Fred Johansen, Yongping Liu, and Xiaoling Zhang. 2018. “Carbon Emission of Global Construction Sector.” Renewable and Sustainable Energy Reviews 81 (January 2018):1906–916. doi:10.1016/j.rser.2017.06.001. 2019/01/21 15:00 - 16:30 Dresden, Germany Back to Nature: How Sustainable is Construction with Wood?